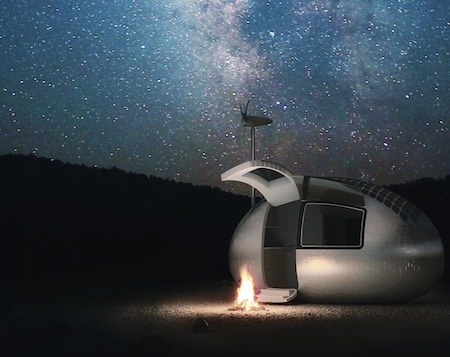 The Ecocapsule is the creation of Slovakian firm Nice Architects, and let me tell you, it's your off-the-grid dream come true. 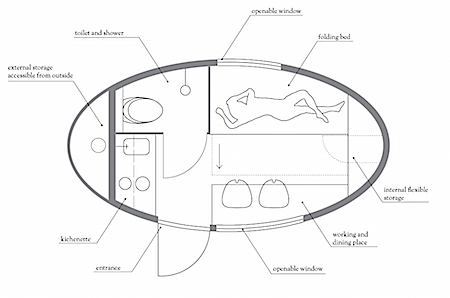 The 14.5-foot, 1.7-ton pod can serve as a research station, disaster-relief shelter, or remote Airbnb almost anywhere. The second-generation version—which is expected to debut this fall and go on sale in 2016 — includes sleeping quarters for two, a kitchenette, a shower, climate control, and even electrical outlets. Plus, it comes equipped with a custom-designed H20-free toilet that incinerates your waste out of existence. A 750-watt wind turbine and 600-watt solar array collect energy. Assuming outside temperatures stay between -13° and 104°F, the capsule can consistently produce all its own power. From Ecocapsule via Popular Science.